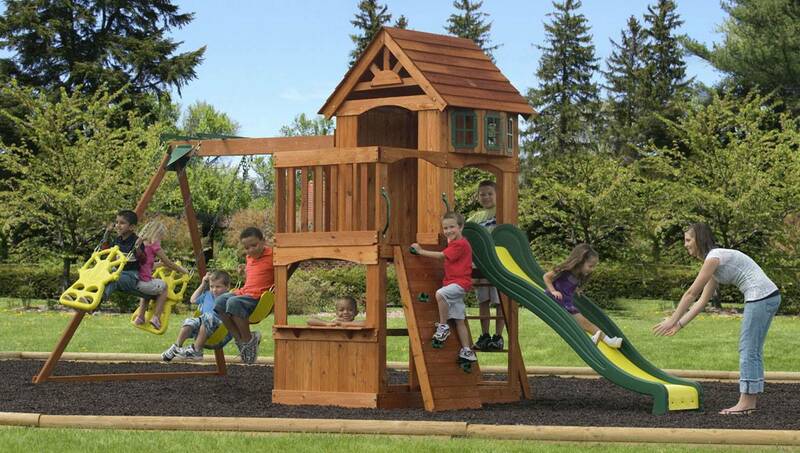 Considering a New Backyard Playset? 6 Things You Need to Know about Safety. So you’re thinking of getting a playset for the backyard. The kids have bugged you about it and now you think you might be ready to take the plunge. Here are a few safety tips to consider while shopping for backyard play equipment. “Avoid equipment with openings above the ground that are greater than 3 1/2 inches but less than 9 inches. Look for swings with at least 8- to 12-inch spacing between each other and the support frame, and at least 8 inches between the ground and the swing. Tandem pendulum swings should have 16-inch spacing. The highest climbing rung or platform shouldn’t exceed 6 feet for school-aged children or 4 feet for preschoolers. Avoid metal parts. The metal can heat up on hot days in the sun and cause burns, and it can rust on rainy days. If you do get a playset with metal additions, make sure they have rust-resistant and heat-resistant coating to prevent these issues. Color makes a difference. If you have a choice between colors on your playset, choose yellow; it stays cooler in the sun. Soften the inevitable falls. Before assembling the playset, add some mulch, wood chips or sand to protect your children in case of a fall. Cypress wood mulch doesn’t decay and repels insects. Never attach — or allow children to attach — ropes, clotheslines or pet leashes to play equipment. Check for hardware, like open “S” hooks or protruding bolt ends, which can be hazardous; Check for sharp points or edges. Remove tripping and falling hazards, like exposed concrete footings, tree stumps and rocks, extending at least 6 feet out from the playset in all directions. Minimize mosquitoes during the warm months. Check for areas where standing water can accumulate. Standing water is a breeding ground for mosquitoes. If you find that the playset is accumulating water, be sure to empty the water at least twice per week. Learn 10 more ways to control mosquitoes in your yard. The playset pros over at King of Swings are a great resource for your playset needs. Our kids have personally tested them! Of course, playsets aren’t fun if you’ve got mosquitos on the prowl. All of Mr. Mister’s services are safe for both pets and children, and all systems are discreetly installed so they won’t interrupt playtime. Find out more about how we can help make your backyard fun for the whole family.